As you know, I co-lead history tours with Philippa Lacey Brewell of British History Tours. 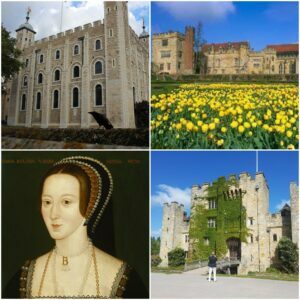 This year, we are running the Anne Boleyn Experience (an Anne Boleyn focused tour based at Hever Castle – yay!) in May 2019 and the Executed Queens Tour (Anne Boleyn, Catherine Howard, Lady Jane Grey and Mary, Queen of Scots) in July 2019. I am so excited about both of these – two opportunities to talk Tudor, hear some great speakers and see some beautiful places. We have a room sharing possibility for the Anne Boleyn Experience in May as we have a lady who is ready to book on confirmation of a room-mate. Sharing a room saves you the single supplement and worked out really well for those who shared rooms on our last two tours – they became firm friends. The Anne Boleyn Experience is rather special. We stay for the entire tour at Hever Castle (squeal! It’s my favourite historical place!) with exclusive use of the Astor Wing, which includes our bedrooms (all luxury, they’re gorgeous! ), a withdrawing room, billiard room, private dining room, large outside areas, heated outdoor swimming pool and tennis courts as well as out of hours access to the entire Hever Castle grounds. We are also dining in the Castle dining room on one night, after a private out of hours tour of the castle. As well as Hever Castle, we will also visit Penshurst Place (stunning! It was a film location for The Other Boleyn Girl) and the Tower of London. We shall be at the Tower on the anniversary of Anne’s trial, for a guided tour followed by a tour by Claire (me!) up to the Tower Hill execution site where the men condemned in the awful events of 1536 were executed (I do like to pay tribute to the men too). Click here to find the webpage with full details for The Anne Boleyn Experience. I think it’s only right to think about the men who were also killed on that day in May 1536, Anne dominates the story of her fall and eventual death but we must not forget those who also suffered with her, they too were innocent and we’re just dreadfully unlucky to be caught up in the destruction of Henry V111’s wife, they were mere scapegoats and Henry’s parliament may have called it justice but it was merely butchery, a lot of innocent blood was shed then two days later it was to be the Queens turn, I have never visited Penshurst Place but it was featured in this book I owned once on stately homes of Britain, in one room it showed a beautiful painted mural of ships in harbour, it looked really lovely, who knows I may get to visit it one day.